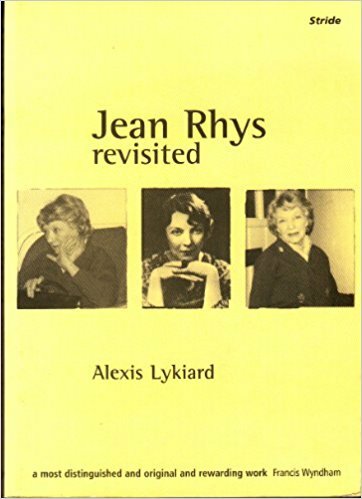 Alexis Lykiard met Jean Rhys in the late 1960s, after her “comeback” with the brilliant Wide Sargasso Sea (1966). She died in 1979. Though his prose is a bit turbulent and clingy, I rather enjoyed this treatise as any Rhys fan no doubt would — if just for the small gems and portraits and Lykiard’s gallant retorts to her detractors. These portraits include one of mega-obscure poet R.C. Dunning, who along with Rhys was a protege of that palindromatic soldier Ford Madox Ford, and whom Rhys quoted at the head of the first — my least favorite — of her novels, Postures (1928, later retitled Quartet).There are some odd misogynies in his book, however simpatico Lykiard feels and at some points proves himself to be. And just plain oddities as well. We are never introduced to a “Diane” who is the young Lykiard’s companion in visiting Rhys. Nevertheless most of the volume’s photos — all apparently taken on a single day, of Rhys around her last home, 6 Landboat Bungalows, Cheriton Fitzpaine, looking grand and dear as ever in her 80s — are, if you plow through to the final page, credited to a certain Diane Leigh. By page 231 she’s still unsurnamed, but pegged as “the willowy figure of my young blonde love” and quoted briefly. Lykiard’s rendering of the writer Angela Carter struck me as unfair; his critiques of Virginia Woolf’s fiction are bizarre in their out-of-the-blue, slap-dash appearances, shameless and unconvincing. There are some rather nice ruminations on writers Henry Green and George Moore (author of one of Rhys’ favorite novels, Esther Waters, 1894) and a goofy if weirdly touching male view of what it might have been like to have been possessed of “brains and beauty” a la Mina Loy, Djuna Barnes, and Rhys. However much my ship of comprehension went aloft o’er Lykiard’s waves of nostalgic philosophy regarding the hardscrabble rhapsody of a writing life, it was embarrassing. You’ll also need to skip some of the sections where he really falls down the rabbit hole of autobiography as tribute to great writer (or else listen now to my description of my copy of Rhys’ story collection Tigers Are Better Looking, bought at Shakespeare & Co. — and marked with their round stamp — on my first trip to Europe, and read aloud in an orange and blue room with one of my sisters, rain and Parisians outside high slanted windows) — Rhys is nowhere to be found in some chapters as, for example, he tells us about writing the novel that broke him — alors! — out of commercialism and into obscurity. If you haven’t yet rambled the Rhysian reams of her own Letters 1931-1966 (ed. Francis Wyndham & Diana Melly, Penguin, 1984) surely that should come first, this second or — not to be nasty, but there is her “unfinished” autobiography, Smile Please (1979) — third.